Like many other well-loved comfort foods, rice pudding recipes have a long and delicious history. It’s believed to have originated, as a recipe, in the Middle East as a kind of porridge like dish made up of several indigenous grains. Rice puddings are a staple in many cuisines that have rice as a staple, usually in the form of sweetened rice slowly cooked with a milk or cream based liquid. As with all recipes certain ingredients are necessary, like RICE, others are a personal preference. Some rice pudding recipes use eggs, which creates a custardy type of pudding, while others eschew them creating a creamier dish. A multitude of spices can be added i.e. nutmeg, cinnamon, and lemon or orange zest, raisins or other dried fruits are all considered “must haves” in many recipes. Please use REAL vanilla in your rice pudding recipes, the fake stuff is just icky and the real stuff taste is soooooooo much better. Or, if you’re feeling really feeling adventurous, try using a vanilla bean and trust me, you’ll never want to go back to the liquid. Feel free to experiment with other ingredient additions as you like. 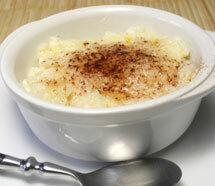 You can use just about any type of rice in rice pudding. Brown rice makes a nuttier dessert, while long grain rice adds a different texture to the dish. Like many other kinds of puddings rice pudding has often been used in the sickroom and as kiddie food. Not so with the following recipes. They are all adult friendly and you may have a fight on your hands with the kids for the leftovers. There are also several cooking methods – stovetop or baked, quick or slow each considered the gold standard by its own die hard rice pudding favorite fans. Whichever way you decide to create your creamy rice pudding, I say any kind of rice pudding is great as far as my taste buds are concerned.